All Out Africa employs a network of over 40 field and office staff in more than 4 countries. Together we work as a team, to ensure the success of the project, as well as the enjoyment and fulfillment of the volunteer. The Team listed below highlight some of the core areas of this network but do not in any way account for all the others who work so hard to make the success of our projects possible. Kim is the Founder and Director of All Out Africa. He grew up in rural Eswatini and attained his MSc in Conservation & Ecology. Before starting All Out Africa in 2004 he spent 7 years working on various conservation and community development programs in Eswatini. Kim’s professional interest is in developing sustainable entreprenurial solutions for conservation and community development in Africa. His personal interests include his family, sport, wildlife, travel and people. 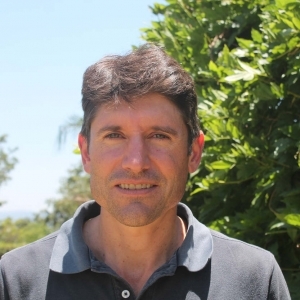 Roland is our Director of Tours and Expeditions, based in our Tours Department office in Malkerns, Eswatini. 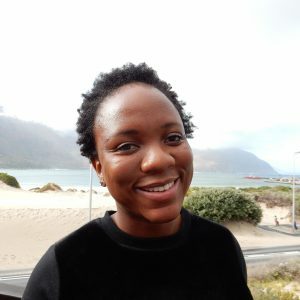 Rols is an environmental tourism practitioner from Eswatini with interests in responsible travel, tours and expeditions, community development, conservation, program management and entrepreneurial development. Michelle joins the All Out team as the FIRST Swazi Operations Manager! 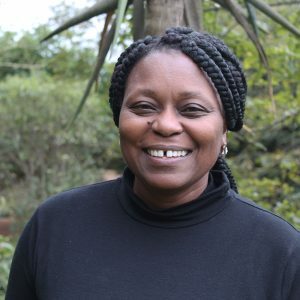 Michelle manages all our projects and country destinations, and is based in our Head Office in Eswatini. As a Swazi national she has a huge passion for both Africa and volunteering. 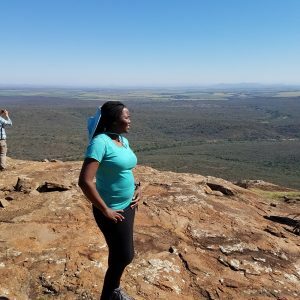 Her experience in the travel industry has given her a unique perspective, but her real passion is empowering Swazi people. She is excited to be given the opportunity to do this along with the help of our international volunteers, and our expert team. Ginger Green is a native of the USA, where she graduated with a BFA in Art & Design from Columbia College in Chicago IL. She has over 10 years experience in Design and Marketing. 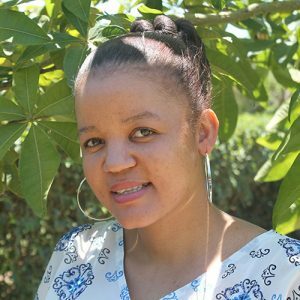 As a former volunteer placed in Eswatini, Ginger has spent the last 8 years in the country working as a marketing consultant and is now happy to call Eswatini home. 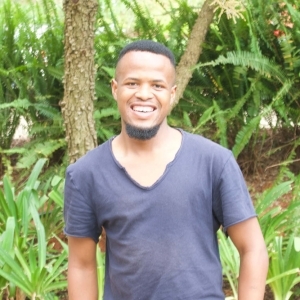 Tiphiwe holds a Diploma In Call Centre Management and Interpersonal and currently pursuing an Advanced Diploma in Business Management at Mananga Centre. She has just joined the All Out Africa Team and is excited to understand and appreciate the culture of different people from different countries. Tjengisa Dlamini has qualifications in Sustainable Community Development, which he obtained at the University of Swaziland at a degree level. 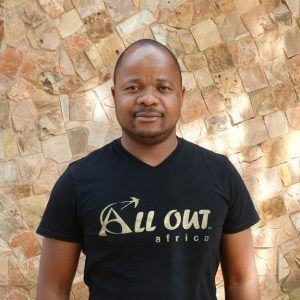 Tjengisa joined All Out Africa in April 2015, as our Social Projects Coordinator has been quoted as being "excited and privileged" that he would be heading a department related to Social initiatives among communities, be it rural or urban communities. He seeks to guide Swaziland Social Projects in creating sustainable grass-root community projects, to better the less fortunate population in the Kingdom of Eswatini. 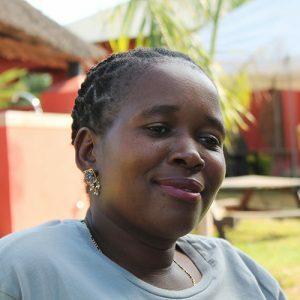 Eunice works for All Out Africa as the NCP (Neighbourhood Care Point) Coordinator in Ezulwini, Eswatini and provides invaluable support as well as lots of laughs with her outgoing personality in the office and out in the field with the volunteers. Michael is originally from Mbabane, Eswatini and works in Eswatini as the Building Coordinator. He has 15 years of building experience in the private sector. He enjoys working with volunteers because after guiding a team in local building methods, they work passionately to finish the project. Michael also serves as the Siswati teacher for interested volunteers and backpackers. He has been with All Out Africa since 2009. Menzi has worked with volunteers for 4 years. Originally from Manzini, Eswatini Menzi operates as the Sports Coordinator. He earned his degree from the Market Theatre in Johannesburg, South Africa after which he joined the People Educational Theater where he gained experience in sports, theater and clowning. Menzi‘s favourite aspect about Eswatini is it’s vibrant culture and laid back atmosphere. 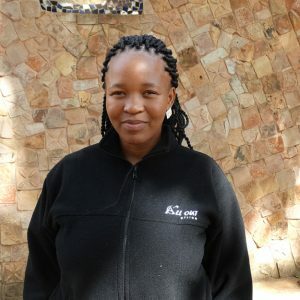 Xolile works for All Out Africa as the head office cleaner in Ezulwini, Eswatini and provides invaluable support as well as lots of laughs with her bubbly personality in the office. She‘s recently picked up the nickname "Dorothy", but no matter what we’re calling her, she’s our ray of sunshine with the best giggle to match. 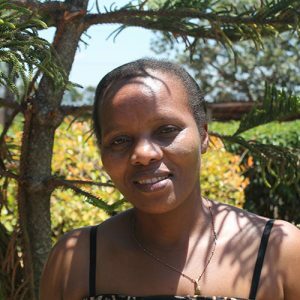 Nomcebo works for All Out Africa as the Office Coordinator in Ezulwini, Eswatini. She provides support to our team in Swaziland, as well as all our destinations in terms of arrivals, departures and confirming bookings of each and every volunteer! Jackie is the Tours Director of All Out Africa. Originally from the UK she has lived in Africa and Asia. With a BSC in International Relations and other qualifications, she has a keen interest in international development and the capacity building of people and organisations. As an experienced independent traveller Jackie enjoys developing and exploring new itineraries and opportunities for people of all ages with a range of interests. She is loving living and working in southern Africa and being part of the All Out Africa team. Nana has a BTec in Tourism Management, a Certificate in Front Office from Tshwane University of Technology and is currently working towards a degree in Business Administration. Nana is passionate about traveling, loves meeting new people and is a lively member of the Tours team! 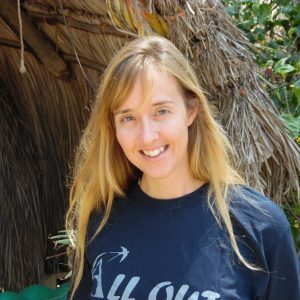 She joined the All Out Africa Tours team in November of 2014 and has developed good relationships with our suppliers and partners ensuring the successful running of ours scheduled tours. Nana’s main responsibility is our financial procedures and record keeping - watch out Tours team if your reconciliations are incomplete, Nana will be in touch! Lindo is our new travel consultant at All Out Africa Adventure Tours and was recruited after successfully completing a 7 month internship with us. Lindo has an Associate Degree in Tourism from Limkokwing University in Swaziland. 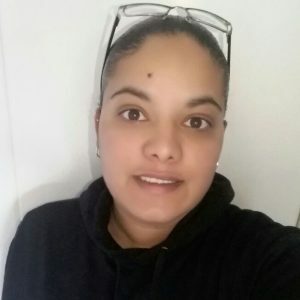 She has a keen interest in travel and is looking forward to learning more as she helps others with their bookings and travel plans. Lindo dreams of running her own travel agency one day. Ngeti joined our team in August 2018 and has settled in nicely. She has formed good friendships, is quick learner and works hard. 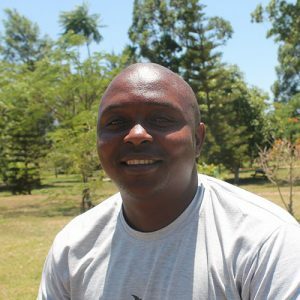 Ngeti has a degree in Tourism and experience in leading local tours as well as planning them. Bob is a well-loved and respected tourism practitioner from Eswatini, and the lead Tour Guide for All Out Africa. His interests include backpacker travel, tours and expeditions, wildlife guiding, cultural guiding and community development. His relaxed nature puts volunteers at ease, his knowledge of wildlife and cultural facts ensures that volunteers get the most out of their tours and his patience allows for everything to run smoothly. Sikelela is our All Out Africa Adventure Tours Fleet and Storeroom Coordinator who was born in Eswatini. Sikelela does vital support work for the drivers and guides, ensuring that the equipment and vehicles are in good order. As a holder of his Public Drivers Permit Sikelela is also able to help with transfers. He also plays a key role in comping operations for Bushfire Festival, World Challenge and Swazi Rally. 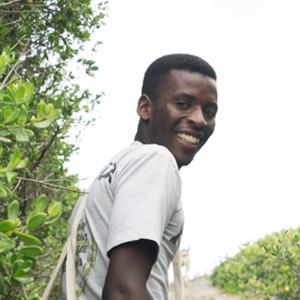 Ayandza is a multi-talented member of the Tours team as he has an Associate Degree in Graphic Design and is one of our lead hiking guides. Ayandza has been a key player in our hiking map design. Ayandza is responsible for the porter and hiking teams on our school group expeditions focusing on the Malolotja region, and although he is naturally an introvert he is actually one of the friendliest members of the tours team. Sipho is an experienced driver and guide who has worked for All Out Africa Adventure Tours since 2016. As well as holding a Public Drivers Permit Sipho is also qualified to drive the Mercedes Sprinter. Sipho often leads our tours to Tofo in Mozambique and also the Cultural Village Tour here in Eswatini. He is a laid back chap who is liked by all of our travellers. Melusi is one of All Out’s most bashful tour guides. His mild mannered nature is what draws many people to him, and as such our volunteers and travelers always speak highly of him and enjoy getting him to come out of his shell. The going joke in the office has often been how he and Melissa would claim to have swapped roles in the office as they both hold the nickname "Mel" which appears on the Tours Office task and schedule boards. December studied Natural Resource Management at South African Wildlife College in Kruger National Park and holds the Swaziland Tour Guide and St John’s Ambulance First Aid Certificates. 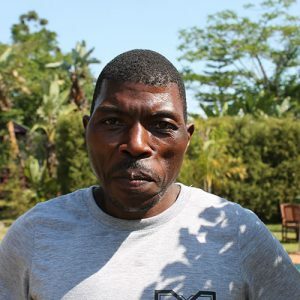 From the Lubombo Region, December is our lead hiking trail guide in that area and has been a hiking guide since 2002. Everyone in the team acknowledges December’s expertise in the natural environment as he always amazes us with stories about trees, birds and fruits especially when he leads tours. December also has the biggest smile in the Tours team! 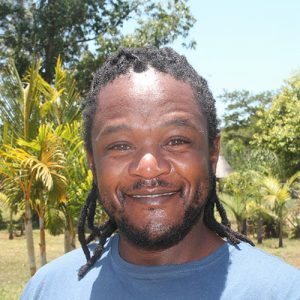 Sanele is a super friendly guide, based in the home of our Lobamba Village Walking Tour. Sanele enjoys football but is also a font of knowledge regarding Swazi history and culture. He also acts as a support guide for our bigger tours, ensuring groups feel welcome. You can’t beat his welcoming smile. Our most stylish driver, Bongani supports us with our tours operations through picking up clients from Johannesburg and dropping them in locations through Eswatini. Bongani is a friendly guy who has worked with a range of client of all ages. A welcome addition to the team. Kwanele is a Eswatini freelance driver who has worked for over 5 years driving groups around Eswatini and beyond. He holds his Public Drivers Permit and is qualified to drive our largest vehicle, a Mercedes Sprinters. This experience has been useful during events such as Schools Week at Bushfire and with our World Challenge groups that travel with us each year. A quieter member of the team you will be safe in his hands! Thando has a great sense of humor and showed himself to be a fast learner when he started working with us. With a heavy duty license and public drivers permit he is able to drive all of our vehicles. Thando is related to two of our other drivers. Can you guess which ones? Adriaan joined us in 2018 and has been developing our Kruger Operations as well as our Kruger Safaris. Adriaan has a number of qualifications relating to wildlife, conservation, and hospitality making him an asset to the team. He is Afrikaans, from a close family Adriaan and is a very friendly guy – with a lovely dog aptly named Kruger! Adriaan is a keen photographer and enjoys capturing those special once in a lifetime moments in Kruger and beyond. Check out our Instagram page to see examples of his shots. 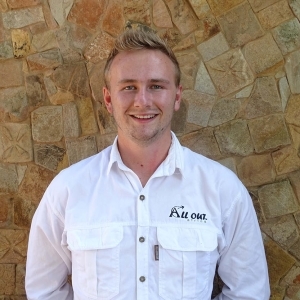 Ruben started working for Tours in 2018 and enjoys his role as a fully qualified Kruger Safari guide. Ruben enjoys wildlife and learning new things demonstrated in his extensive range of qualifications. He is happy to talk about trees, birds and all sorts of species on his tours. Ruben has been trained in leading trips to Eswatini and the Panorama Route and is enjoying learning more about Mozambique. Ruben likes meeting the volunteers on our scheduled tours and like Adriaan is a keen photographer. Phumie is the Lidwala Backpacker Lodge manager, a lodge proudly owned and operated by All Out Africa in Ezulwini, Eswatini. He has always said that his primary goal is to give customers the best experience possible. He feels that his experience with hosting our volunteers is the best so far because you get to know them and make friends or know them enough so you get to know their characters so you can juggle what you can do to keep them happy while they are at the lodge. Phumie says, so far so good and is confident that team Lidwala can keep it growing from strength to strength. Phetsile is the assistant manager at Lidwala Lodge. 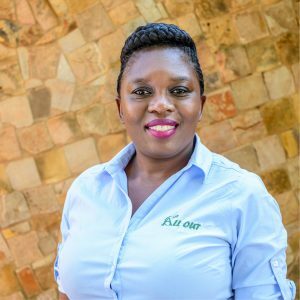 She was born in Eswatini and has an undying passion for the hospitality and tourism industry. She joined the team in July 2014 as an intern and she became a full time part of the team as assistant lodge manager in October 2014. She has an Associate Degree in Hotel Management which she obtained from Limkokwing University of Creative Technology. She strives for continued excellence in providing the best services at the lodge. Cassendra Pamela Steenkamp holds an Associate Degree in International Tourism from Limkokwing University of Creative Technology. I am passionate about travelling and meeting new people. I reflect a varied personality including ambition and the quality of generosity and thoughtfulness. 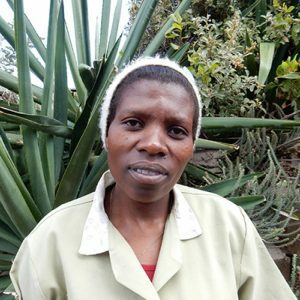 Nonhlanhla is affectionately known as Mildred and is arguably Lidwala Lodge’s best cook. Her Eswatini Traditional meals on a Tuesday have people coming to the Lodge from far and wide around the valley and its surrounds. Jabu is an invaluable member of the Lidwala Lodge staff and people often refer to her as make (pronounced maa - ge) which means mother in SiSwati, the native language of the Kingdom. She is an incredible seamstress and she’d probably be able to pick out at least one item of clothing in the staffs weekly wardrobe that she has either made or tended to. Ncobile is arguably Lidwala’s friendliest face and has been with the team through highs and lows over the years. She will make sure that everything is spick and span for guests arrival and leaves her personal touch on all that she does. 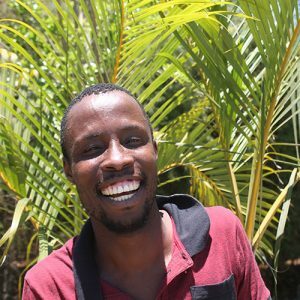 Sibusiso is the gardener with the infectious smile. Always ready and eager to help where he can and making sure along with his colleagues that the stunning sprawling grounds that make up All Out Africa Head Office and Lidwala Lodge are manicured and well kept all year long. General forms part of the gardening team at Lidwala Lodge and is the one who skips to his own drum. Always smiling and upbeat, nothing seems to bother him. Makhosini is our gentle giant, towering over us all at a staggering 6ft 6", forms part of our awesome security crew. His charm and laugh gets everyone chuckling along with him, whether or not we’ve gotten the joke! Solly is the latest member to the gardening crew and is often referred to as the shy one. We understand, Solly, we are quite the eclectic and colourful family to fit into, you will too soon! All Out welcomes Solly to the team! Mdu as we all know him is All Out Africa’s local Assistant Savannah Conservation Coordinator and he has been out at the Mbuluzi Game Reserve where our research centre is based, since almost the beginning of it all! He is our tracker extraordinaire and conducted vast amounts trapping research on small rodents, birds and bats, collating invaluable data for the centre. My name is Simelane Phumlile from Nhlangano. I am currently working for the Savannah Research Center as an assistant coordinator. My interests are in ecology, wildlife and conservation. I hold a degree In Science (Biology and Chemistry), and a Master’s degree in Ecology and Conservation. Tristan Diedrick, originally from Kwa Zulu Natal, South Africa and now reside in Hout Bay, Cape Town. I am 28 years old and have my diploma in Hotel Management. I am outgoing, family orientated and enjoy meeting new people. Having studied Tourism Management, Nqobile fills the vital role of All Out Africa‘s Bookings & Administration Officer. 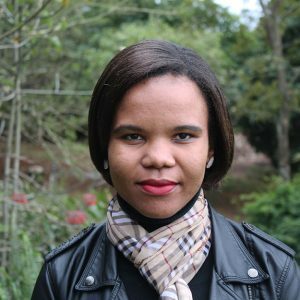 Based in our Swaziland office, she has a passion for travel and sustainable tourism. She has a deep admiration for volunteers, citing them as some of the bravest people by their ability to leave their comfort zones and explore strange and exciting places, while doing good and giving back at the same time. She loves Swaziland for the generous spirit and harmony of the people, and is sure that our volunteers will likewise appreciate the locals’ warmth and hospitality that is so synonymous with the southern Africa culture. Ruth works at Hout Bay Backpackers as the cleaner. She is from the Eastern cape and she has two beautiful children who love to visit the lodge every once and a while. She has been with Hout Bay Backpackers right from the beginning and has provided much needed support! Katie has a degree in Zoology from Trinity College in Dublin and a Masters by Research in Medical Science from the Royal College of Surgeons in Ireland. Her previous tropical and marine field experience focused on butterfly assemblage changes in response to disturbance in Sulawesi, Indonesia, parasite-loading in fruit and insectivorous bats in Uganda, sampling and processing for habitat mapping of the Irish Sea, and currently reef health and large marine fauna species off the coast of Mozambique. Katie is fascinated by scientific experimental design and data collection structure. She enjoys teaching and developing the capacity and sense of wonder and appreciation in others. France, a Mozambican native, works as the Mozambique Social Projects Coordinator. He has experience in the hospitality and community development fields. 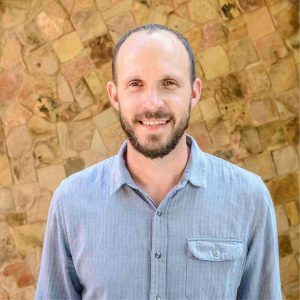 He enjoys exposing volunteers to the rich spirit and culture of Mozambique, while employing their skills in the much needed community development projects. Not only is he an expert on the area, but he is also a qualified Advanced Diver!